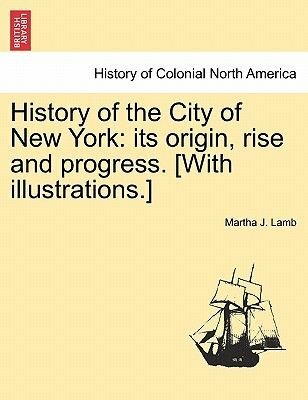 Title: History of the City of New York: its origin, rise and progress. With illustrations. ]Publisher: British Library, Historical Print EditionsThe British Library is the national library of the United Kingdom. It is one of the world's largest research libraries holding over 150 million items in all known languages and formats: books, journals, newspapers, sound recordings, patents, maps, stamps, prints and much more. Its collections include around 14 million books, along with substantial additional collections of manuscripts and historical items dating back as far as 300 BC.The HISTORY OF COLONIAL NORTH AMERICA collection includes books from the British Library digitised by Microsoft. This collection refers to the European settlements in North America through independence, with emphasis on the history of the thirteen colonies of Britain. Attention is paid to the histories of Jamestown and the early colonial interactions with Native Americans. The contextual framework of this collection highlights 16th century English, Scottish, French, Spanish, and Dutch expansion. ++++The below data was compiled from various identification fields in the bibliographic record of this title. This data is provided as an additional tool in helping to insure edition identification: ++++ British Library Lamb, Martha J.; 1877.]. 2 vol. ; 8 . 10412.gg.11.